" We are looking only for Local inquires Which is in Vidarbha Area." Water is the most vital liquid for all forms of life. Water has always been an important and life-sustaining drink to humans and is essential to the survival of all organisms. Excluding fat, water composes approximately 90% of the human body by mass. It is a crucial component of metabolic processes and serves as a solvent for many bodily solutes. Though 70% of the earth is covered by water not all is fit for drinking. 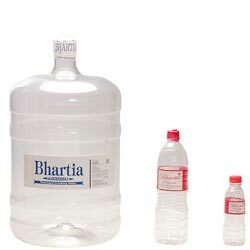 With a view to provide pathogen free potable water, Bhartia Group has successfully established a brand which stands for quality and service. Brand "Bhartia" is a synergy between decade long experience(quality) and infrastructure(service). Following a proactive approach towards the technological upgrades, the group boasts of manufacturing packaged drinking water using the ultra modern RO technology confirming to the BIS standards(IS 14543). The distribution network is extensively spread across vidarbha and our products are both admired and appreciated.